To make the marshmallow frosting, add the rose water and warm water to the marshmallow frosting mix and allow to stand for a few minutes. Beat on high speed for 6-10 minutes until the mixture becomes thick and fluffy. Set aside. Preheat the oven to 220º°C. Brush 6 cups of a non-stick muffin tray with melted butter. The muffin cups should be approximately 7 cm in diameter. Lay the puff pastry sheets flat and cut out 6 circles approximately 8 cm in diameter. In a large frying pan, sauté the apple wedges in 100 g of butter until tender. This can be done in batches if necessary. Arrange the apple wedges in circles in the bases of the buttered muffin tray cups, packing them until very full as the apples will shrink while they cook. Place the remaining 100 g of butter and sugar in the frying pan and cook until starting to caramelise to a golden toffee colour. It is not an issue if the mixture separates as it will re-combine when baked. Add the salt flakes and stir to combine. Pour the toffee mixture over the apples, setting some of the toffee mixture aside for drizzling. 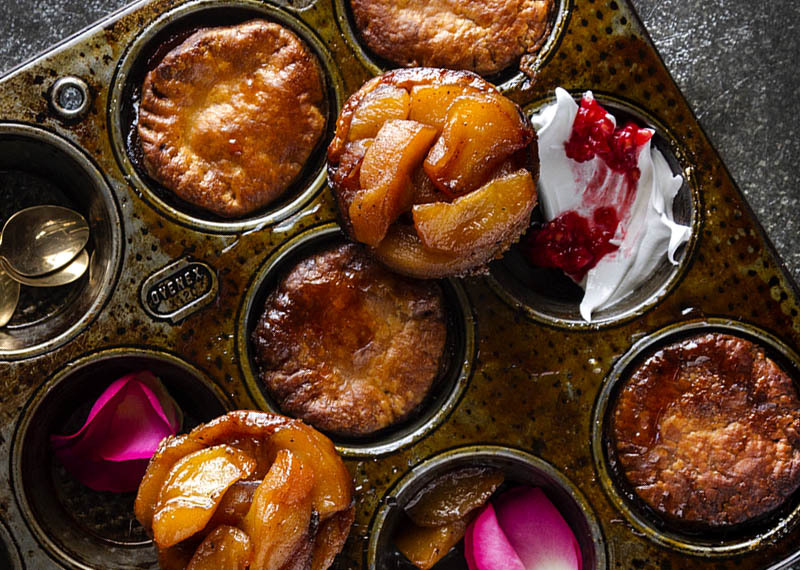 Place a disk of pastry over each muffin cup and press down lightly to secure them. Bake at 220º°C for 10 minutes and then at 180º°C for another 10 minutes or until the pastry is cooked. Turn the tarts out and serve them apple side up with a dollop of rose marshmallow frosting. Garnish with rose petals and fresh raspberries.